For Halloween, the young company Opera 5 has come up with an inventive programme of three one-act operas all based on short stories by Edgar Allen Poe. The triple bill is presented under the umbrella title In Pace Requiescat. First up is The Cask of Amontillado (2003) by American composer Daniel Pinkham (1923-2006). Next is the fragment of Claude Debussy’s opera, La Chute de la maison d’Usher, left unfinished at the composer’s death in 1918. The evening closes with the world premiere of Opera 5’s first-ever commission, The Masque of the Red Death by Toronto-based composer Cecilia Livingston. The three are presented in a unified production directed by Aria Umezawa and make a fascinating evening with an impact greater than the sum of its parts. The production designer has created a set that looks like a derelict room where a huge party has been held. The stage and the area in front of it where action also takes place is littered with liquor boxes, wine bottle and beer kegs. One of the borders above the stage is askew as is a drape of plastic sheeting. And a television set is perched on some boxes centre stage. A concert grand piano house left is used for the accompaniment for the first two operas. Seven musicians of the Toronto Pop-Up Orchestra conducted by Constantine Caravassilis, join the piano for the final opera. There is a strong goth influence on Vaile’s costumes and on the lurid make-up by Lisa Macdonald and Mariana Delancey that makes the singers look like relatives of the Addams Family. Yet Vaile adds a few choice details – a jabot or a cloak – that make reference to the Renaissance. Before each opera starts baritone Adrian Kramer reads the beginning of the source narrative in Poe. In each case we see how closely the various librettists have followed Poe’s words. Pinkham’s The Cask of Amontillado is in a mid-20th-century melodic style quite similar to that of Gian Carlo Menotti. 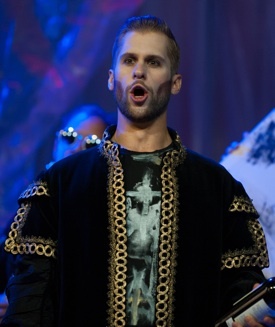 In the 35 minutes of the opera, Montressor (Kramer) lures the ill and drunken Fortunato (Justin Ralph), the man he regards as his enemy, into nitre-covered catacombs where he immures him alive. Kramer has a wonderfully rich, strong baritone that makes him ideal as the dominant personality of the two. As an actor he is excellent at conveying the hatred that animates Montressor’s words and the pleasure he feels in baiting Fortunato’s vanity to entrap him. For his part Ralph’s high tenor captures the mixture of weakness, illness and pride of his character. Umezawa has the clever idea of using the chorus, who would normally appear only in the scene depicting Venetian revels, throughout the action. Holding up stretched canvasses of various sizes they represent the walls of the vaults the Montressor and his victim travel through. At the end they become the stones that Montressor mortars into place in front of Fortunato. It’s a fine work I’m glad to have encountered. Without a break Kramer doffs his cloak as Montressor to become the Doctor in La Chute de la maison d’Usher. The ebb and flow of the vivid piano accompaniment by Maika’i Nash immediately plunges us into a sound world not unlike that of Debussy’s Pelléas et Mélisande. What is quite different, however, is that Debussy wrote his own libretto for this work and it is emphatically not in the style of Maeterlinck. Maeterlinck’s Pelléas set by Debussy is characterized by dialogue consisting almost entirely of sentence fragments as if the characters were so oppressed by an atmosphere of gloom they could utter no more. In Usher, the characters sing in long, complete sentences which flow on languorous currents of Debussy’s music more naturally than do the fragments in Pelléas. American David Tinervia has a lush lyric quality capable of beautiful pianissimi. Because of this he is an ideal choice for the hyperaesthetic Roderick, tortured by his secret love for his sister. Lucia Cesaroni, with her rich mezzo, gives an eerie portrayal of Roderick’s sister Madeline, who already has gone mad. Kramer as the Doctor and Ronan MacParland as Roderick’s friend can only watch helplessly as the two siblings sink further into madness. The production uses all of the music Debussy wrote, leaving MacParland to read the parts of Poe’s tale in French that the music underscores and words that he never was to set. The 25-minute-long operatic fragment does reach some sense of completion since it breaks off just after Roderick accuses his friend of stealing his sister from him. It’s extremely rare to hear this fragment performed at all, much less staged, so we have to be grateful to Opera 5 for giving us the privilege. After an intermission is Livingston’s new 30-minute-long opera, The Masque of the Red Death to a fine libretto in rhyme by Duncan MacFarlane. Tinervia makes a strong impression as Prospero, a man who thinks he can wall out the Red Death that has ravaged the population outside his castle. We hear him move from hubris to horror when he sees that the Red Death (Kramer) has not only entered his party but has claimed his daughter (Cesaroni). Livingston’s music is so eclectic it is difficult to hear an individual voice. She uses Bartókian expressionist effects, writes a 1920s-style cabaret number for the chorus and concludes in a wind-down of Glassian minimalism. Livingston makes good use of the clock mentioned in Poe’s story that stops all the revellers dead, so to speak. She writes gratefully for the voice and gives both Cesaroni and Tinervia chances to explore their dynamic range. The piece would have ended best with Livingston’s music and without the reading of Poe’s own conclusion. By linking the three operas together Umezawa brings out the theme of entrapment they all share. Her least effective decision is to have the chorus move in a distorted manner as if they were zombies. They can’t actually be zombies since they have to die of the red death at the end of the third opera, so it might have been better to gives the chorus the kind of stylized movement one might find in German Expressionist films without alluding to the pop-cultural fad of the moment. All in all, In Pace Requiescat is a rewarding evening both from a musical and literary point of view and provides a fine showcase for young operatic talent. Now that the COC Ensemble no longer presents their own operas, it is heartening that a company like Opera 5 has come along to perform the fascinating shorter works that larger opera companies ignore. Photo: (from top) Daniel Tinervia (centre) with chorus in The Masque of the Red Death; Adrian Kramer in The Cask of Amontillado. ©2013 Emily Ding.